The amount of the aurora nights (green bar) is visually studied from the 1 minute resolution movie for every observation night. The night with any visible aurora in the view is calculated as an aurora night. The iCCD camera season starts around 20 August and end around 20 April. 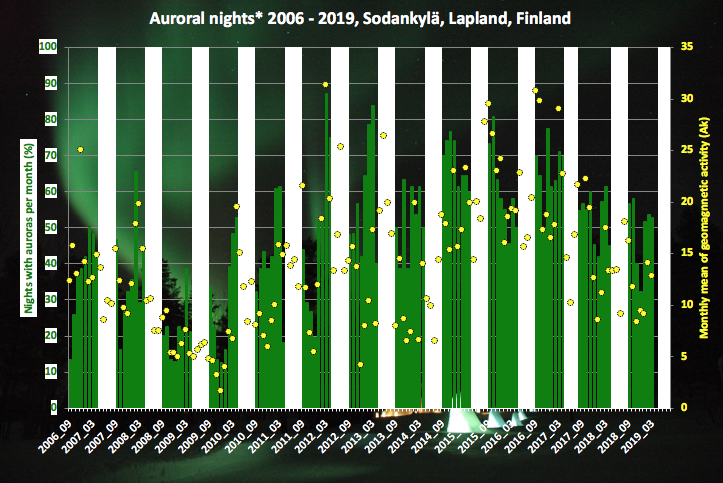 Aurora rate for Aug and Mar is calculated against observation nights. The yellow spots present montly average of the daily geomagnetic activity index Ak.